Inspired by the recently issued Hampton Court stamps, we paid a visit to our “local” hedge maze this weekend. Saffron Walden is only an hour away from us, and is always a good day out. We shared the magic of the maze with our 9-year old granddaughter, just as parents and grandparents have been doing for nearly 180 years. 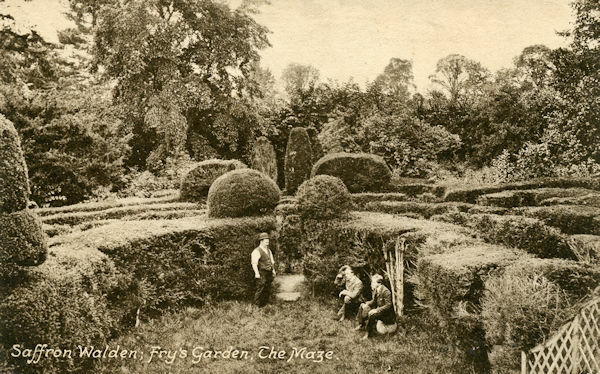 The photo below, circa 1905, is on a card postmarked 1920, and features the gardener, Mr. Swan, chatting to some visitors. There are, of course, many labyrinthine delights in Saffron Walden, as well as an outdoor market, cute shops, and cafes to enjoy, and it was fun to see it all through the eyes of a child. 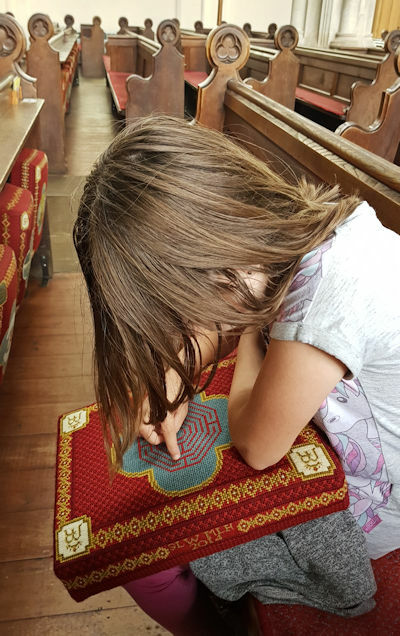 We saved most of the labyrinths for another time, but Lucy managed to spot one in St. Mary’s Church when we stopped in for a look around. I love that photo of Lucy at the entrance to the maze! Looks like makings of a faerie tale!